Each hanger has loops for scarves, hand towels and other dorm accessories in a cute birdcage design to add to dorm room decor! Dorm Co. Tip: Add some dorm hangers for your dorm accessories to save space and organize your dorm closet! Have no idea where to store your scarves, hand towels, and other dorm accessories in your dorm room? It's understandable - those dorm essentials are pretty hard to figure out where to store. As soon as you figure out how to store them, your dorm room storage idea ends up not working out so well because of course you purchase more scarves and dorm accessories. These fragile dorm accessories require more care than your favorite T-Shirt or pair of jeans. Scarves and belts are made of different materials and scarves can easily get snagged and tear while belts can become cracked. 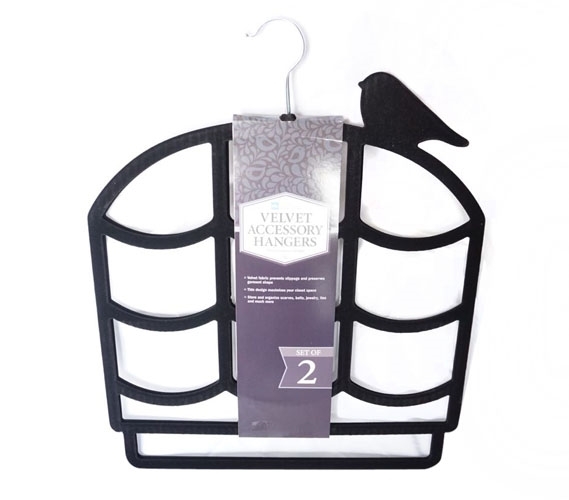 Keep your dorm accessories organized with our Black Birdcage 2 Pack Flocked Scarf Hanger! Our Black Birdcage 2 Pack Flocked Scarf Hanger comes with two dorm hangers so you can have plenty of dorm room storage for those scarves and belts. In each dorm hanger there are nine loops and two bars so you can organize hair accessories, scarves, towels - use your imagination! Plus this isn't an ordinary closet organizer - it is also pretty cute with a bird sitting on top of the cage! Don't let your scarves, belts, and other fragile dorm essentials stay in a heap on your dorm floor or get shoved away in a dorm dresser drawer. Keep those fragile college supplies neatly organized in our Black Birdcage 2 Pack Flocked Scarf Hanger!